Route Option 1. Sparks Street to the area of the Canadian War Museum and the Prince of Wales Bridge. Route Option 3. 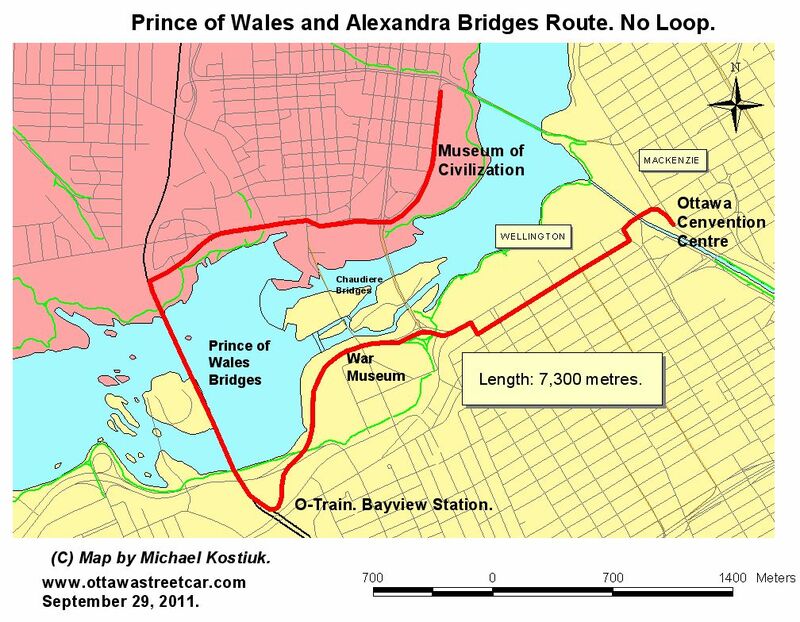 Loop Across the Ottawa River via the Prince of Wales and Alexandra Bridges. Route Option 4. Ottawa Congress Centre to Museum of Civilization via the Prince of Wales Bridge. No. Loop. Route Option 5. 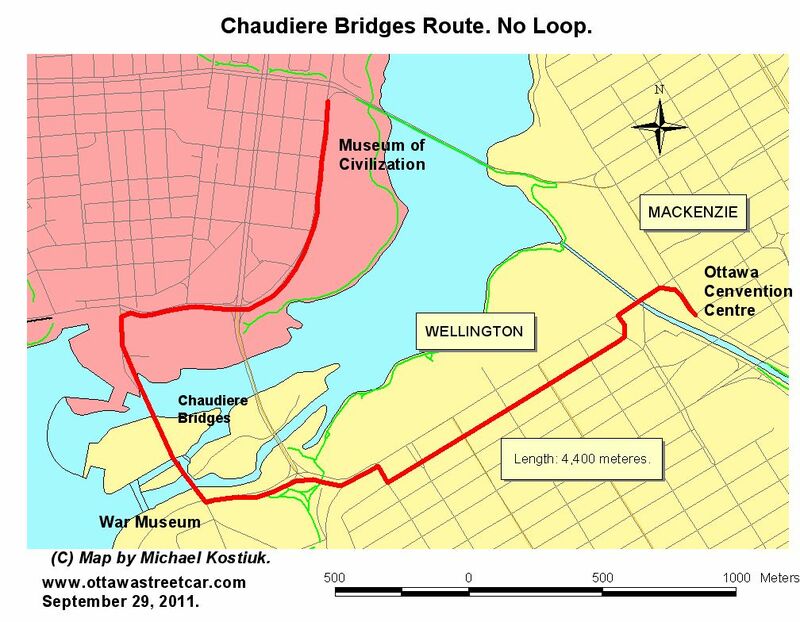 Ottawa Congress Centre Loop via the Chaudiere and Alexandra Bridges. Note. Streetcars once used both of these bridges. Route Option 6. Ottawa Congress Centre to Museum of Civilization. No cross-river Loop. Route Option 7. 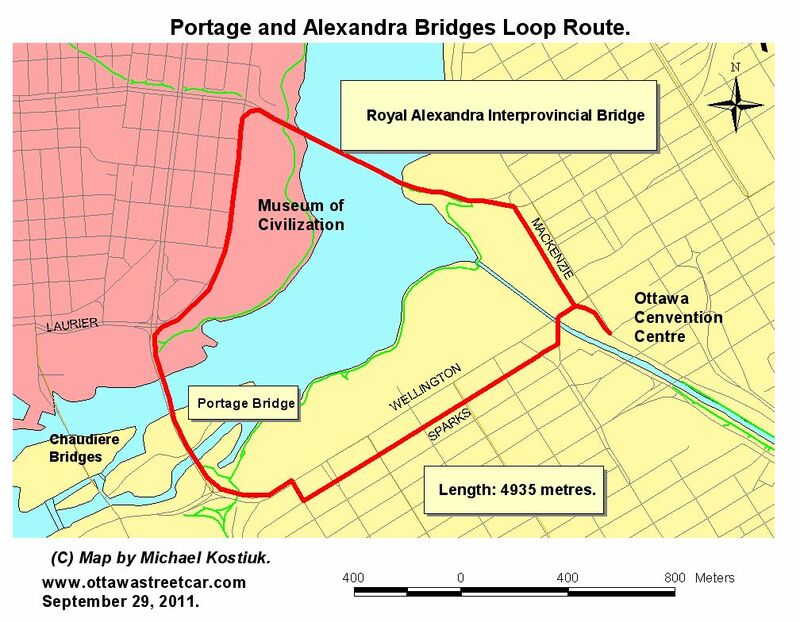 Short Loop via the Portage and Alexandra Bridges. Route Option 8. 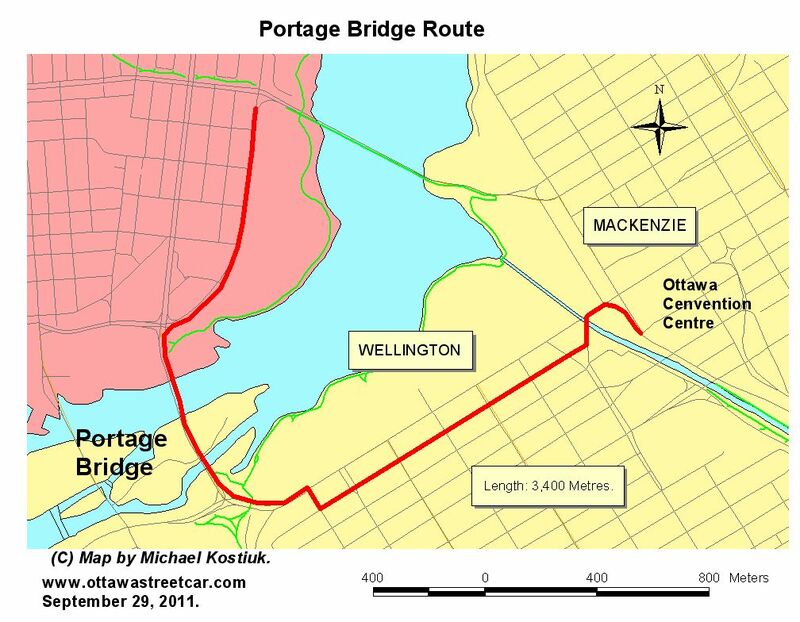 Short Route to Museum of Civilization via the Portage Bridge. No Loop. Route Option 9. 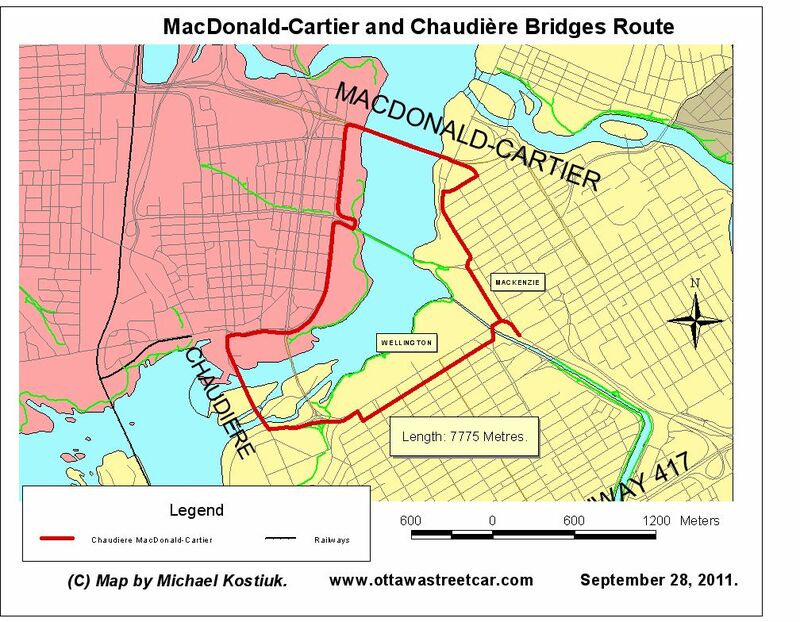 Ottawa Congress Centre Loop via the Chaudiere and MacDonald Cartier Bridges. Allows direct access to Jacques-Cartier Park. 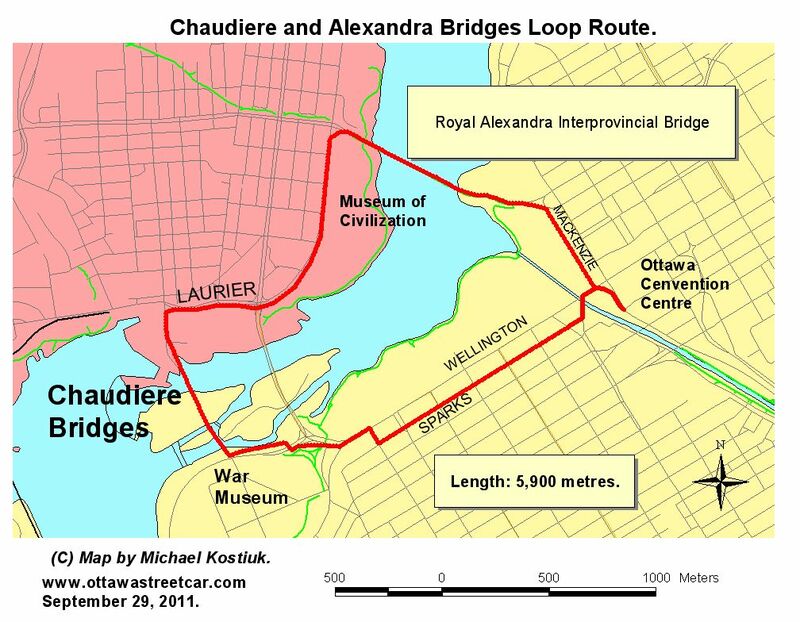 Brings the route closer to the Casino du Lac-Leamy on the Quebec side. Allows views of the Rideau Falls on the Ontario side. Gives direct access Royal Canadian Mint, National Art Gallery, Museum of Civilization, War Museum, Rideau Centre, Ottawa Congress Centre, ByWard Market, National Arts Centre, Parliament Hill and Sparks Street. Not to mention all of the hotels that are located along the route. Route Option 10. "The Longest Route". 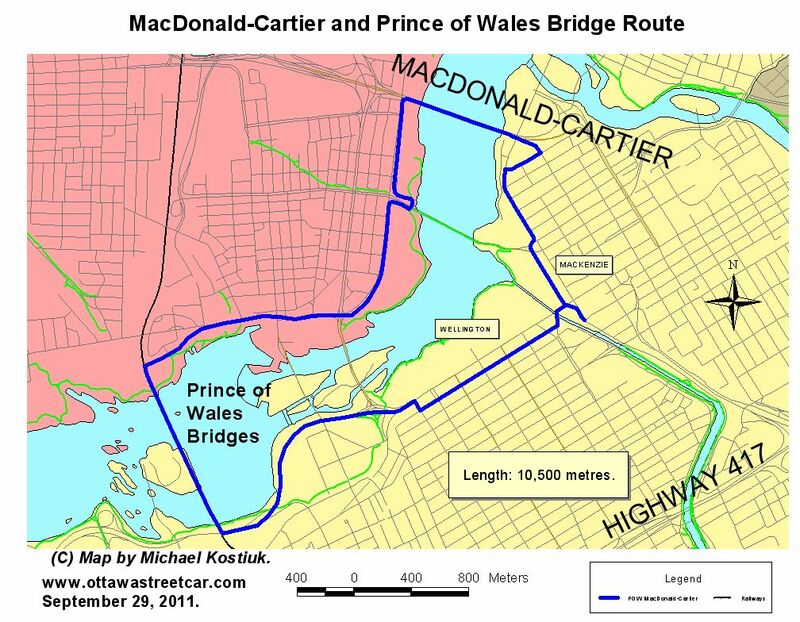 Ottawa Congress Centre Loop via the Prince of Wales and MacDonald Cartier Bridges. 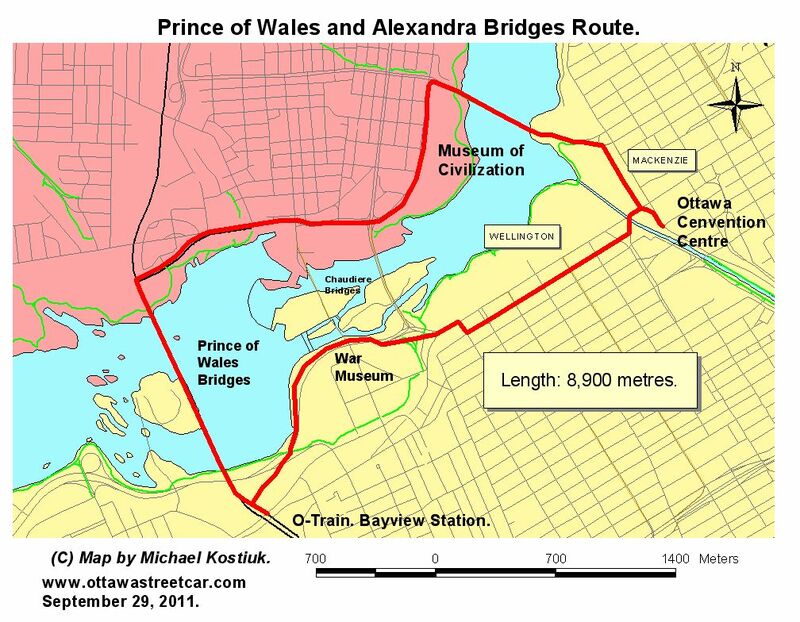 Allows for inter-connection between the O-Train, and possibly Other trains such as the Wakefield Steam Train, or future commuter-style trains at the Prince of Wales Bridge. Allows direct access to Jacques-Cartier Park. 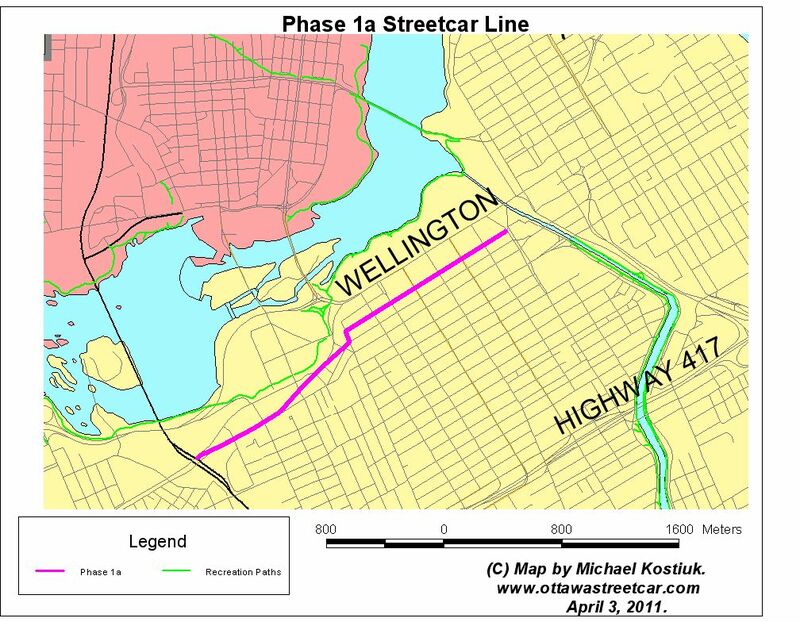 Brings the route closer to the Casino du Lac-Leamy on the Quebec side. Allows views of the Rideau Falls on the Ontario side. Gives direct access Royal Canadian Mint, National Art Gallery, Museum of Civilization, War Museum, Rideau Centre, Ottawa Congress Centre, ByWard Market, National Arts Centre, Parliament Hill and Sparks Street. Not to mention all of the hotels that are located along the route. Web page last updated ny Michael Kostiuk. November 6, 2011. 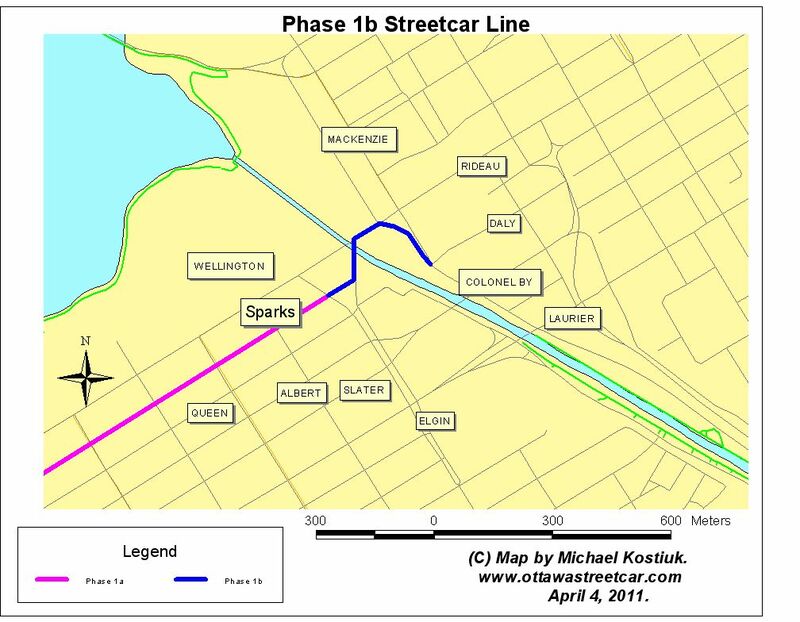 Return to Ottawa Streetcar Home Page.